Since its founding the Schumacher Center for a New Economics has been committed to developing a new tenure system for natural resources — Earth, Air, Fire (the minerals), and Water. Our premise is that these Nature-given assets are our Common Wealth, needed by all. To keep them in private ownership gives an unfair advantage to the titleholder who can charge “rent” for their use – an “unearned increment,” to use the phrase of Henry George. This economic advantage is one of the key reasons for inordinate disparities in wealth accumulation. At the same time a regulation of use is necessary and a means for collecting income from that use is key to ensuring common benefit. Our approach has been to develop non-profit community land trusts to hold and manage natural resources on behalf of the inhabitants of a particular place. The Earth is in crisis due to an economic system that treats natural resources as commodities to exploit rather than as “a community to which we belong,” (Aldo Leopold, 1949). The reform of our property-tenure system is urgent– at stake are the future health of our ecosystem and a fair economy for all. A community land trust is a democratically governed, regionally based, open membership non-profit corporation. Through an inheritable and renewable long-term lease, the trust removes land from the speculative market and facilitates multiple uses such as workforce housing, village improvement, sustainable agriculture, and recreation. Individual or organizational leaseholders own the buildings and other improvements on the land created by their labor and investment, but do not own the land itself. Resale agreements on the buildings ensure that the land value of a site is not included in future sales, but rather held in perpetuity on behalf of the regional community. 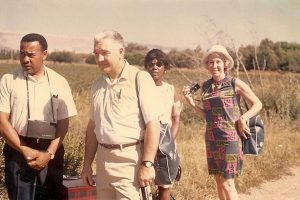 in 1967 in Albany, Georgia, Robert Swann, a pacifist and builder who later founded the Schumacher Center for a New Economics, joined Slater King, President of the Albany Movement and a civil rights activist, out of a common concern to provide access to land for Black farmers in the rural South. They contracted to purchase a five thousand acre farm and began a planning process with local residents to structure ownership and plan a settlement of homes and farm buildings. As part of their research they traveled to Israel to study the legal documents of the Jewish National Fund that separate ownership of land from the ownership of buildings on the land. 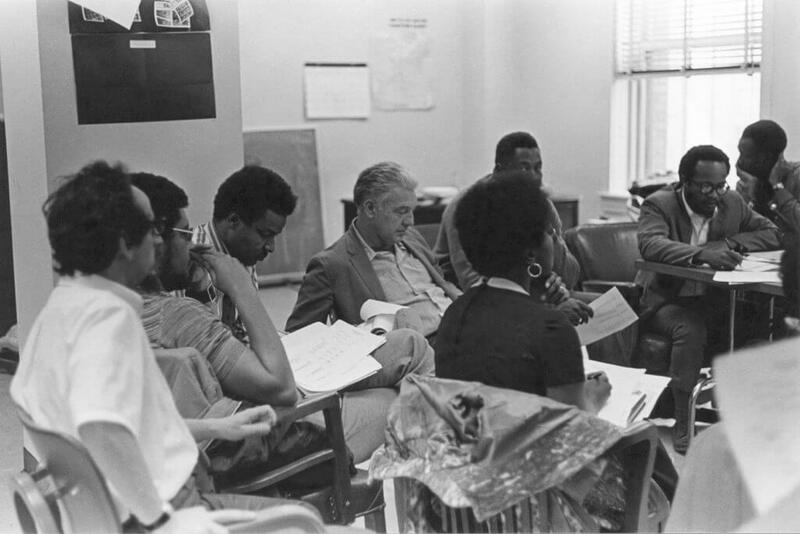 Charles Sherrod, an organizer for the Student Nonviolent Coordinating Committee, and his wife Shirley Sherrod were part of that group. Read Fay Bennett’s report on the Irsaeli trip here. New Communities, Inc., the first community land trust, was formed out of those planning meetings. The story of its creation and its struggle, including a tragic car accident that killed key leaders of the initiative, is detailed in the 1972 publication, The Community Land Trust: A Guide to a New Model for Land Tenure in America by Bob Swann and others available in pdf form here. 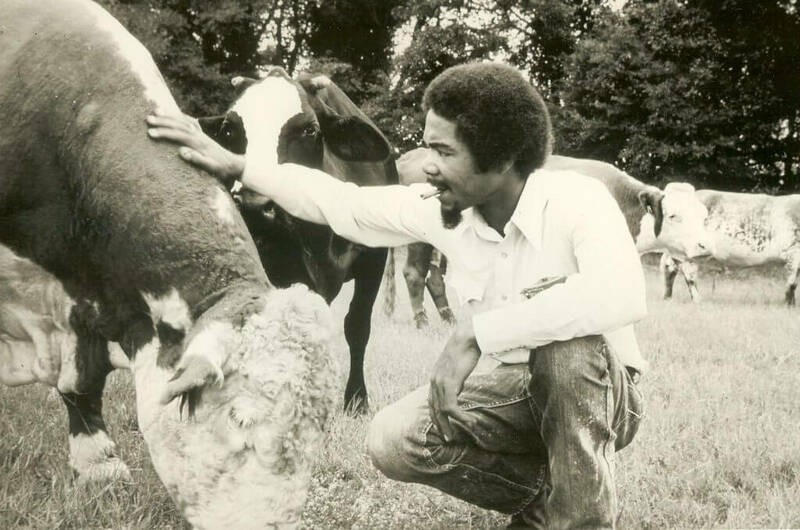 Stanley with New Communities, Inc. livestock. To learn more about New Communities, Inc., and for a chronology of the community land trust movement, visit www.cltroots.org. Bob Swann’s essays about the place of land in the economy and the role of community land trusts in creating a more just and sustainable land tenure system may be read here. The Schumacher Center’s Community Land Trust Program is an education and outreach initiative advocating for adoption of the CLT model through a process of civic engagement. Success stories, background essays, model documents, best practices, and other resources will support concerned citizens in the building of community land trusts in their regions. The strategic goal of the program is to demonstrate how community ownership and control of land can be leveraged to create synergy between jobs and housing. The core message is that the CLT approach to land use builds wealth for the whole community, supporting the workforce, increasing upward mobility and fostering economic resilience. As citizen-led initiatives, CLTs can achieve goals like preserving Main Street for locally owned businesses, improving substandard housing, ensuring local farms produce food for local people using good farming practices, establishing sites for community supported industry, and developing strong neighborhoods for full-time residents with local jobs. The benefit of the CLT’s democratic structure, strong legal mechanisms, resale formulas, and program stewardship is permanent access with long-term affordability. Forest Row, a neighborhood of 18 households on a twenty-one acre site owned by the Community Land Trust in the Southern Berkshires. 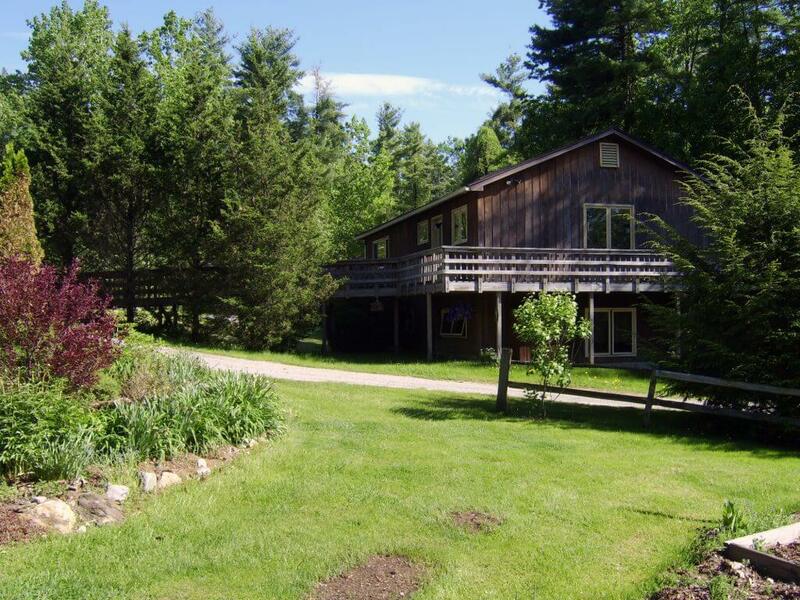 The Schumacher Center for a New Economics has provided research and administrative support to the Community Land Trust in the Southern Berkshires (CLTSB), founded in 1980, and its sister organization, the Berkshire Community Land Trust, founded in 2015. CLTSB owns three tracts of land, including Forest Row, a residential neighborhood of permanently affordable home ownership, and Indian Line Farm, the first Community Supported Agriculture farm in North America, where the lease recognizes the famers’ equity investments in their home, farm buildings, and other site improvements including soil improvements. Still in their initial stage of collaboration, the strategic goal of these volunteer-led sister organizations is to demonstrate how community ownership and control of land can be leveraged to foster economic resilience. Working together they can achieve goals like preserving retail sites for locally owned businesses, ensuring that local farms are producing for local markets, establishing sites for community supported industry, and developing strong neighborhoods for full-time residents. Seventy percent of US farmland is owned by those 65 years and older, with an estimated 400 million acres set to change hands in the next 29 years. It is critical that we identify ways to move land into the hands and care of next-generation farmers building resilient regional food economies. Those farmers should be able to capitalize a business, sustain a livelihood and build equity, while affording secure access to land. What might a sustainable agricultural community look like in the near future? Community land trusts provide regionally based organizations to meet that objective. The 2014 Symposium Our Land, held in collaboration with Agrarian Trust, further explores this issue. More information may be found here. 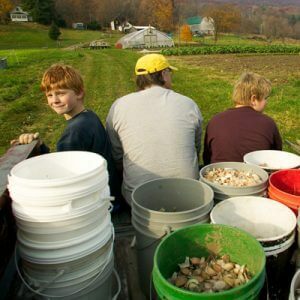 To preserve Indian Line Farm, the first Community Supported Agriculture farm in North America, the Community Land Trust in the Southern Berkshires and the Schumacher Center for a New Economics collaborated with the Berkshire Highlands Program of The Nature Conservancy and farmers Elizabeth Keen and Alex Thorp. The goal was to maintain a working organic farm, protect the adjacent sensitive wetlands, and provide small-scale farmers with affordable access to land. Working with the Schumacher Center to draft the innovative legal documents, The Nature Conservancy acquired conservation easements on the property to permanently limit future development, while the Community Land Trust acquired the title to the land and is leasing it to Elizabeth and Alex on a 98-year basis. 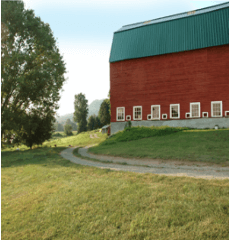 The farmers themselves have purchased the house, barn, and other buildings, and will gain equity through any improvements made to the farm during their tenure, including improvements to the soil. The Community Land Trust retains an option to purchase the buildings and improvements back, and to resell them at their replacement cost to another farmer. Addressing the critical connections between ecology, economy, and community, this model for whole farm preservation is protecting habitat, preserving agriculture and keeping small-scale farming viable. The participation of the two land trusts provided a way for Berkshire residents to finance the purchase of the land. Background material, articles, and legal documents about Indian Line Farm may be found here.